The MetaBatch™ Processor supports Term Store metadata and classification. You can use this feature to maintain your enterprise-wide content types within SharePoint. The MetaBatch ProcessorTerm Store provides significant capabilities beyond the standard classification features in SharePoint. 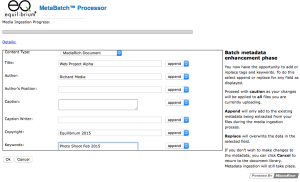 The MetaBatch Processor can either be accessed by using the MediaBatch Uploader or from it’s own Ribbon button. It allows you to edit the values of standard SharePoint metadata fields and Term Store Managed Metadata fields. MediaRich ECM for SharePoint ingests Metadata automatically when images are uploaded into the system. You can view image properties, IPTC (Image), EXIF (Camera RAW), XMP/XMP2 (Adobe and other file types) and industry standard information. Using the MediaRich Document content type, all the metadata fields are extracted and mapped into a standard list of fields. This metadata is automatically indexed, enabling powerful search results without any additional data entry. Information workers can update these fields, store the information in SharePoint, and write it back to the original files for future use.